Promote Your Event on SkooCal! 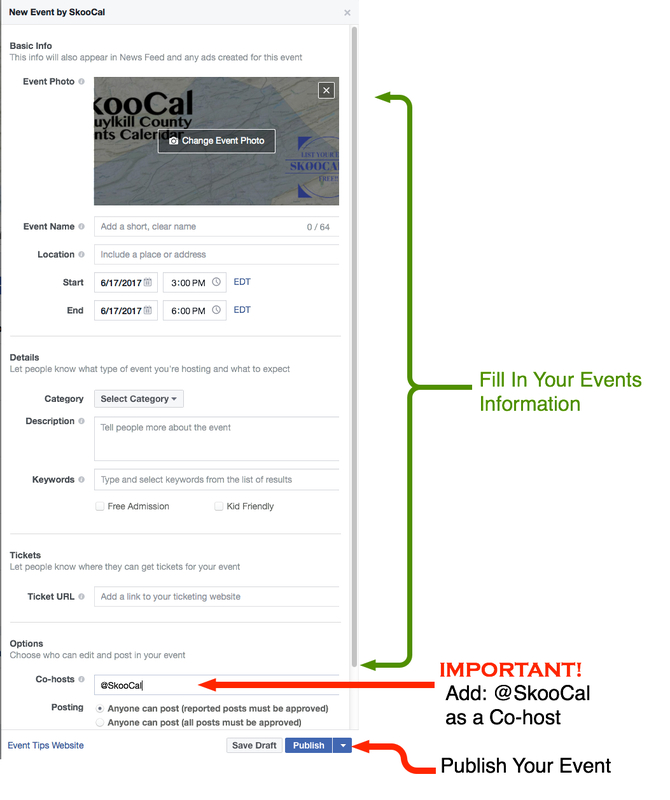 Create your Facebook Event - Go to your organization's Facebook page and create your Facebook Event. Make us a Co-Host: Near the bottom of your create event page, Add @SkooCal as a Co-Host for your event. We will be notified by Facebook of your action. Once we accept, your event will show up here within a few minutes. Please Note: This service is meant for public events. We do not accept commercial "Sale" events. Commercial events that are raising funds for a non-profit or cause, block parties, festivals, entertainment events etc. are acceptable. We reserve the right to exclude any event at any time if we deem it not fitting with the purpose of this list. If you are unsure if your event qualifies for a free listing Contact Us. Your event will publish on this site automatically. 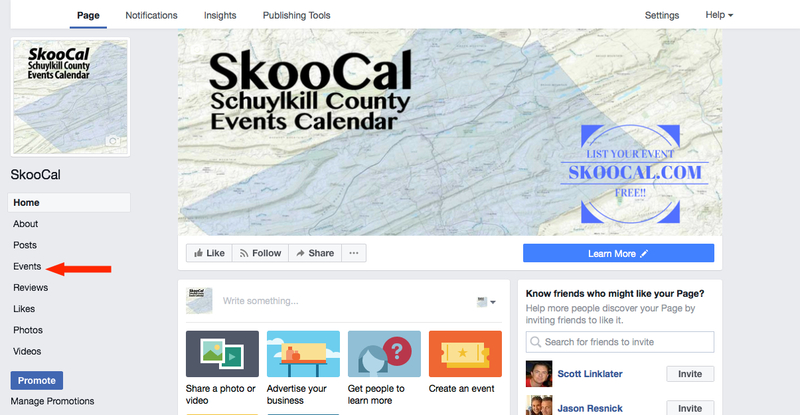 If after 30 minutes you see your event on the @SkooCal Facebook Page but not on this site, refresh your browser. You can not have restrictions set on the event (age limits etc.) You can put restrictions in your description text, but don't use Facebook restrictions. Click Here To Learn How To Make Your Facebook Page Public And Lift Restrictions. Here's a quick fix to make your Facebook Page visible to the public. 2. Make sure you're on your Facebook page. 4. Click on the Settings link. 2. If you listed a specific country, click the "x" to remove it and save your changes. Facebook makes it easy to create an event. Your event will soon be displayed on SkooCal.com. Please take just just 30 seconds and pop over to our Facebook page and leave us a 5-Star rating. It will help us get better rankings in search which will in turn put your event in front of even more people! Don't Have a Facebook Page? If your organization doesn't have a Facebook Page, you have a non-public page, or group instead, you can still get your event listed! For a small fee, we will take care of listing your event on our public Facebook Page and on SkooCal.com for you!